Technology is far beyond our imagination, with our smartphones alot of things can be done. Have you ever wondered of the possibility of using your android, iPhone or iPad smartphone device as a pc mouse? This guide would not only introduce the possibility but also guide you on how to get this done. Most of the time the scenarios that actually triggered us to look for alternatives are normally resulting from malfunctioning or limitation of the available. It also provides a variety of specialty control panels, such as Media Remote, Application Switcher and Web Browsing Remote, which helps you perform specific operations more quickly. How Can I Use My Android, iPhone or iPad as a Computer Mouse? for Android, CLICK HERE for iPhone, CLICK HERE and for iPad, HERE or alternatively for iPhone and iPad go to the app store on your device home screen, after a successful launch of the app store, search for "touch mouse" and click on the download icon on the right corner of the results display and for android user, search for it on play store. Download and install remote mouse server for C HERE. The file most be in a .exe file format for it to run in your Windows computer. Launch the app to continue. 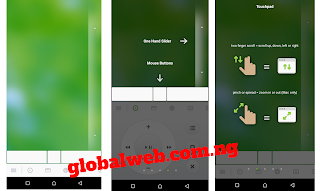 At this stage you already have the remote mouse app and the server installed in you andriod, iPhone or iPad smartphone respectively. And you have currently launch both the app and server as well. In the Auto connect method, you will have to connect both you device and the computer to the same Wi-Fi. This means that you will need a third device like another mobile phone to provide Wi-Fi network for you by creating a hotspot. In the IP address and QR Code connection method, you will need to turn on the personal hotspot on your smartphone device and connect your computer to the device's hotspot. Once the hotspot connection is established, click the plus sign at the top right corner of your smartphone screen to access the IP address and QR Code connection options. Click on your desired method. For IP address, launch the remote mouse from your PC by clicking its icon in on the task bar. Next click IP address to get it displayed. For the case of QR code, it is also the same approach with the IP address method but this may require internet connection to get the code displayed. The plain green space is used to control the PC mouse pointer. If you use your finger to pan or scroll around the green area, the pointer in you PC will respond accordingly as if you are using touchpad or mouse. You can also enable gyro botton from the app settings on your mobile phone for more functionality like moving your smartphone around to control the computer. You can work around in the app to explore more usage. This is indeed a very good app you all need to give a try. We like comments, do share your experience and or complaints with us. Join our Telegram Channel for more updates.